Pasta is for us, like many I’m sure, a common fallback meal. You know, those days when either plans don’t quite work out or you get to almost dinner time and have no idea what you are eating. Pasta often helps us out. The only problem with that is we tend to end up having it only two ways: with pesto or bolognese (meat sauce). True, I make both from scratch and they are good, but I have been trying to mix things up a bit to add some variety recently. I previously made a tasty chard pesto and mozzarella orzo bake and took this as inspiration for something new. 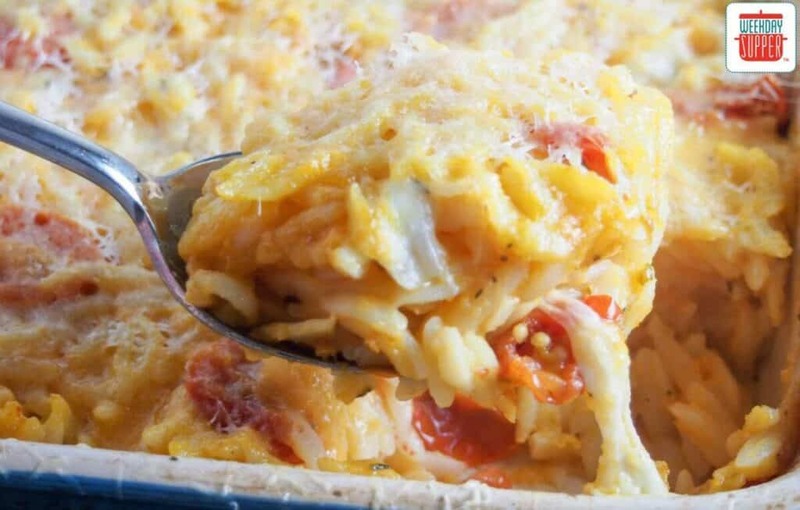 This cheesy orzo pasta bake with roast tomatoes and squash is just that. 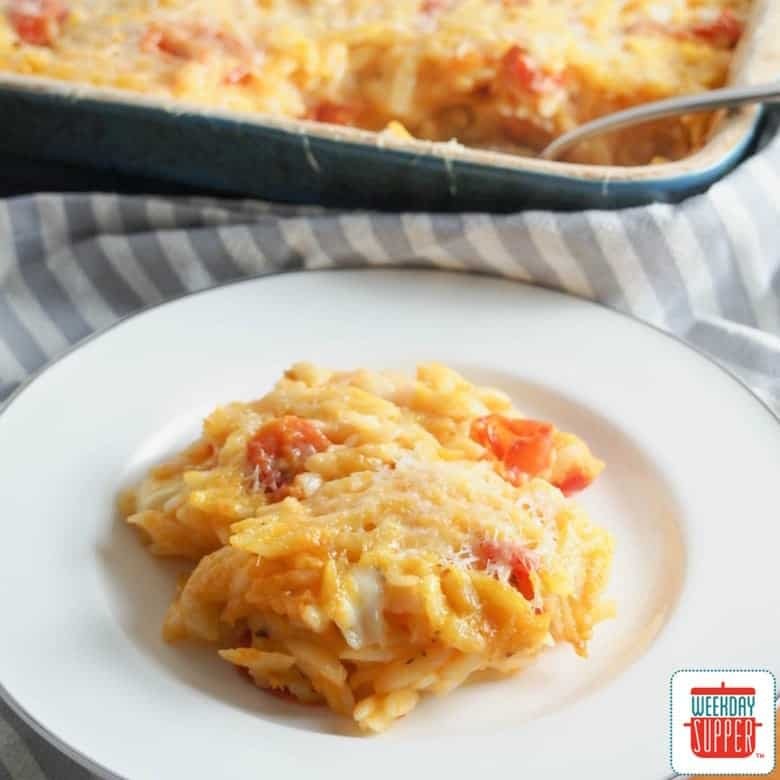 It’s a comforting, hearty dish that’s perfect for colder weather, but those fresh little bursts of tomato also lighten it up too. True it takes more time than a super-simple pasta, but it’s easy and much of that time is hands-off. And it sneaks in some healthy veggies too. It might be surprising to some, but I wasn’t brought up with mac and cheese – it’s just not really a thing in the UK, where I am from. We had cauliflower cheese instead, but that’s one for another post. What it means, though, is it’s not something I ever really make, as I’m not the biggest fan. It crossed my mind that I might be making my son miss out, but I have found when he has tried it elsewhere, he doesn’t seem to like it. How that’s the case when we are big cheese fans, I don’t know, but there you go. 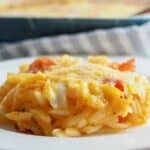 This cheesy orzo pasta bake is something that works for us and I think would please the mac and cheese lovers as well. It’s a comforting dish that meets the cheesiness you might be craving, but without the traditional sauce that we’re not such fans of here. Instead, it has a sauce made with roasted squash, with chunks of gooey mozzarella and bursts of roasted tomato throughout. It’s comfort food on a plate, with a slightly healthy twist. 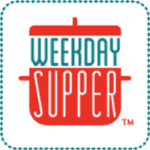 Plus it’s perfect for Meatless Monday and Weekday Supper as well. Preheat oven to 400°For 200°C. Cut the tomatoes in half and put them in a small baking dish. Toss with the oil and turn them cut side up then sprinkle over the thyme and salt. Roast for approximately 20-25 minutes until soft and mildly caramelized. Leave the oven on. Meanwhile, cut the squash into chunks and steam until tender. Blend to a puree and add the cream and stock. Cook the orzo per package instructions then mix through the butternut squash sauce. Cut the mozzarella into chunks and toss them, plus the cooked tomatoes, carefully through the orzo. 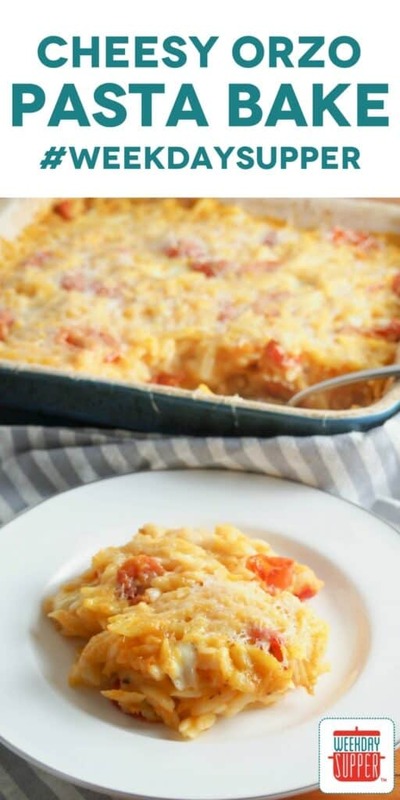 Pour into a baking dish, top with the Parmesan and bake to crisp up the cheese, approximately 15-20 minutes. This dish looks so warm and comforting. Perfect for cooler days. I don’t use orzo enough! It’s one type of pasta I forget about. This looks like a great meal! I love orzo and every ingredient in this dish. Looks amazing and I can already taste it. Can’t wait to try your recipe!